Gold Cup, Model LCF-7, automatic, stainless steel intermittent motion, large cup, rotary cup filler and heat sealer. rated from 6 to 25 cups per minute – depending on materials, application, environment and machine configuration. Fill range: Fill range: 1/2 oz to 16 oz. Cup size up to: 5" Dia x 7-3/4" High, with proper change parts. Equipped with 21" OD rotary turn table with (6) cup pockets, screw cup denester, Spee Dee volumetric filler, pre-cut foil lid magazine with pic n place, pneumatic heat sealing head and sweep arm reject station. A/B controller with start, stop, jog, fill, vacuum, and heat, on / off switches and e-stop. Mounted on stainless steel base frame with casters. Gold Cup, Model GC6-16, automatic, stainless steel intermittent motion, rotary cup filler and heat sealer. rated from 6 to 25 cups per minute – depending on materials, application, environment and machine configuration. Fill range: Fill range: 1/2 oz to 8 oz. Cup size up to: 4" Dia x 4-1/2" High, with proper change parts. Equipped with 16" OD rotary turn table with (6) cup pockets, screw cup denester, pre-cut foil lid magazine with pic n place, pneumatic heat sealing head and sweep arm reject station. A/B controller with start, stop, jog, fill, vacuum, and heat, on / off switches and e-stop. Mounted on stainless steel base frame with casters. 6 station rotary cup filler with flow metering rated for up to 50 cups/min. Unit has vacuum pick off and heat sealer for pre-cut foil seals. Equipped with 3 gallon S/S hopper, E-Stop button, no container/no fill and digital display. Automatic, stainless steel, rotary cup filler rated up to 30 cpm – depending on materials and application. Equipped with rotary table, cup denester, product hopper, piston fill station, die cut foil tamper-evident heat seal and sweep arm discharge station. Gold Cup, Model GC6-16, automatic, stainless steel intermittent motion, rotary cup filler and heat sealer. rated from 6 to 25 cups per minute – depending on materials, application, environment and machine configuration. Fill range: Fill range: 1/2 oz to 8 oz. Cup size up to: 4" Dia x 4-1/2" High, with proper change parts. Equipped with 16" OD rotary turn table with (6) cup pockets, screw cup denester, pre-cut foil lid magazine with pic n place, pneumatic heat sealing head and sweep arm reject station. A/B controller with start, stop, jog, fill, vacuum, and heat, on / off switches temp heat seal controller, fill time counter and e-stop. Mounted on stainless steel base frame with casters. 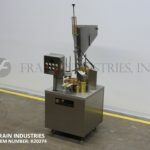 Gold Cup, Model GFC-6, automatic, intermittent motion, rotary cup filler, heat sealer rated from 5 to 30 cups per minute – depending on materials and application. Fill range: Fill range: 1/2 oz to 8 oz. with proper change parts. Cup size up to: 4" diameter x 4-1/2" high. Equipped with 5 gallon hopper, 16" OD rotary turn table, cup denester with 36" high cup magazine, positive displacement filler, pre-cut foil lid magazine with pic n place, pneumatic heat sealing head and sweep arm reject station. Control panel with start, stop, fill, vacuum and heat on / off switches on, off and jog / run controls with e-stop and mounted on stainless steel base with locking casters. Automatic, stainless steel, rotary cup filler rated 10 to 30 cpm – depending on materials and application. Equipped with rotary table, cup denester, product hopper, piston fill station, die cut tamper-evident heat seal and sweep arm discharge station. Tooling required per application.